In our daily lives, we are often bombarded by external experiences that show cruelty and heartlessness. We are influenced by these situations and begin to believe that in order to be happy we need to follow a particular behavior, obtain an array of material items and/or attain a certain status. Little by little, our kind heart becomes obscured by shields; the natural authentic dynamic flow of who we really are gets blocked. So we escape, blame or numb ourselves to what is really happening. Then the ruminating mind takes over deepening a false veil on our perceptions. Volunteers Needed for today's teaching! Amy J. Miller (Ven. Lobsang Chodren) first encountered Tibetan Buddhism in the spring of 1987 during a course at Kopan Monastery in Nepal. Since then, she has spent a great deal of time engaged in meditation retreats, study, teaching, and Buddhist center management throughout the world. Prior to meeting the Dharma, Amy was a political fundraiser in Washington, DC and also worked for Mother Jones Magazine in San Francisco, California. Amy also trained as an emotional support hospice counselor during the peak of the AIDS epidemic in San Francisco and offers courses and retreats on death and dying and end-of-life care. From 1992–1995, Amy managed Tse Chen Ling Center in San Francisco, California. She then served as Director of Vajrapani Institute, also in California, from 1995–2004. From 1998–2002, she was also the Manager of the Lawudo Retreat Fund (which supports the center in which the sacred cave of Kyabje Zopa Rinpoche is located) in the Mt. Everest region of Nepal. In 2004, after resigning as Director, Amy completed a seven-month solitary retreat at Vajrapani. For most of 2005 and 2006, she organized international teaching tours for and traveled with the esteemed Tibetan Buddhist master, Ven. Kirti Tsenshab Rinpoche until Rinpoche’s death in 2006. Amy then became a touring teacher for the FPMT. From 2008–2014, Amy was Director of Milarepa Center in Barnet, Vermont. Amy has also had the good fortune to visit Tibet in 1987 and again in 2001 as a pilgrimage leader for the Institute of Noetic Science in the United States. She has also led pilgrimages to India, Nepal, Bhutan, Darjeeling, and Sikkim for the Liberation Prison Project and Milarepa Center. The next pilgrimage Amy is leading is a trek October 2018 to Lawudo Retreat Center in the Mount Everest region of Nepal. A 4-day retreat will be included along with a visit to Lama Zopa Rinpoche’s birthplace. See Amy’s website below for more information. Amy was ordained as a Buddhist nun in June 2000 by the great Tibetan master, Ven. Choden Rinpoche, and has been teaching extensively since 1992. Her teaching style emphasizes a practical approach to integrating Buddhist philosophy into everyday life. She is happy to help people connect with meditation and mindfulness in an effort to gain a refreshing perspective on normally stressful living. Amy’s courses and retreats focus on establishing and maintaining a meditation and mindfulness practice, death and dying, overcoming anxiety and depression, battling addiction, dealing with self-esteem issues, and cultivating compassion and loving kindness. She is also often involved in leading a variety of retreats. 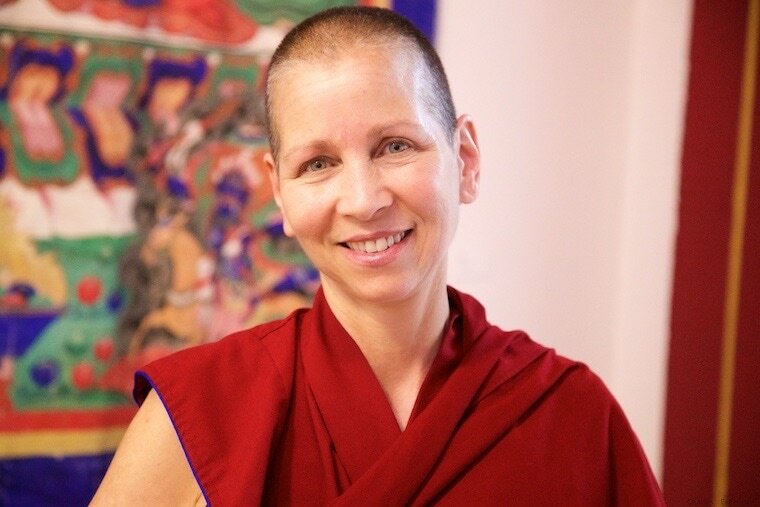 Amy is the co-author of Buddhism in a Nutshell and a contributor to Living in the Path, a series of online courses produced by FPMT. Based in the United States, in Philadelphia, Pennsylvania, Amy teaches and leads retreats and pilgrimages around the world. Her teaching schedule and other information can be found at www.AmyMiller.com. Sponsor Ven. Amy's full weekend of teachings to receive priority seating and a special gift from Ocean of Compassion.